It's clear that riding a motorcycle is potentially more dangerous than driving a car. One doesn't have to be a physician to appreciate that a collision that would cause only minor damage to a car or truck could cause catastrophic injuries to a motorcycle rider. A motorcycle driver must constantly exercise the skill of balance in order to avoid having a single-vehicle accident. Extra precautions to ride defensively and thus avoid collisions are even more critical for motorcyclists than other vehicle drivers. In order to ride more safely, a motorcyclist must anticipate any situations or obstructions that have a propensity to cause an accident. Unexpected turns, loose gravel and animals on the road are unexpected events that frequently cause serious motorcycle crashes in Canada. Simply keeping the possibility of these events in the forefront of your mind when riding your motorbike can go a long way to evading a collision. The most common cause of motorcycle accidents is speeding. Today's motorcycles seem like rockets with respect to their ability to accelerate from 0-100 miles per hour in just a few seconds. Because of new technology in motorcycle construction, traveling over 80 miles per hour doesn't provide a sensation of excessive speed to a motorcyclist. As every motorcycle owner knows, it can be difficult to stay under the speed limit as it can feel like you’re almost standing still. While driving in a straight line, driving fast may not in itself cause an accident. It's when you are required to quickly react that excessive speed becomes hazardous. The following events can occur unexpectedly and cause you to have a motorcycle accident if you are speeding. Be aware that there are unexpected turns somewhere on every road. Most high-speed motorcycle accidents are the result of the rider not being able to negotiate an unexpected curve in the road. These mishaps can occur more frequently on scenic drives and country roads. While there is nothing more fun than a ride on a beautiful weekend afternoon on the back roads, unexpected curves can cause you and your motorcycle to fly off the road and crash into trees or slam into the guard rail, and both may result in catastrophic injuries. Canadians know that snowfall is inevitable in the winter months. Although salt is applied to icy Ontario roads in high volume traffic areas, road maintenance crews also treat roads with dirt, sand and gravel in many areas. Sand and gravel is rarely picked up in the spring; it is left to accumulate and for the most part, is moved naturally to the side of the road by passing traffic. If you are on a motorcycle you need to be aware of the possible effects of leftover sand or gravel accumulation. Loose gravel can easily cause motorcycles to slide and lose the ability to turn at intersections or when avoiding an obstruction, and potentially cause the bike to slide out from under the rider. It's not difficult to guess the type of injuries that could occur as a result; the least of which would be a severe road rash. Another cause of motorcycle accidents in Canada is hitting or trying to avoid animals that sometimes dart across the road. Each year hundreds of motorcycle accidents happen when a deer, moose or another large animal dashes unexpectedly in front of a passing motorcycle. These animals can weigh 500-1000 lbs or more so it is often the motorcyclist who experiences the most damage in a collision with large mammals. Of course, even the smaller animals that frequently traverse Ontario roads, such as groundhogs, raccoons and family pets, can cause major injuries to a motorcyclist if they lose control in order to avoid these creatures. When cars or trucks dash across an intersection in front of a motorcyclist, it is not uncommon for the motorcycle driver to crash or spin out while attempting to avoid a crash. Other drivers on major highways sometimes fail to maintain a safe distance from motorcyclists which has resulted in catastrophic accidents for the motorcycle rider, particularly when there are sudden changes in the speed of traffic or unsafe passing situations. 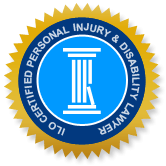 If you have been involved in a Collingwood area motorcycle accident due to the negligence of another person or driver, you need to contact the Collingwood ILO (Injury Lawyers of Ontario) law team. You can expect to talk to a Collingwood motorcycle accident lawyer who is knowledgeable and experienced in every aspect of personal injury law and will provide you with zealous legal representation. We can provide satisfied client references to demonstrate our passionate work ethic. Call us as soon as possible to ensure that all pertinent accident documents and witness testimony is obtained as documentation for your case.